In short, Morchella hotsonii is insufficiently known at present; it is, at a minimum, extremely rare--and it may not have been documented since Snyder's collection. Morphologically it is very similar to Morchella importuna, with its regularly "laddered" ribs and channels, but the DNA result indicates clearly separated phylogenetic species. 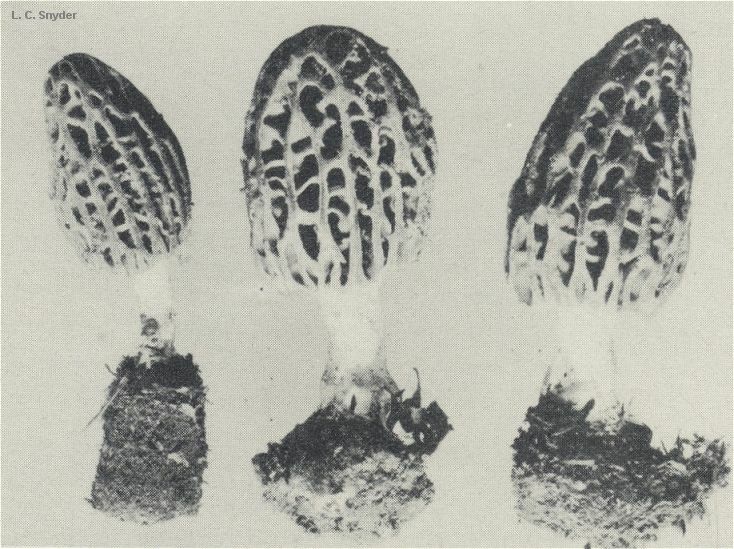 Morchella hotsonii Snyder, 1938: University of Washington Publications in Biology 8: 53. Original description (Snyder 1938): "Pileus stipitate, elongate, conical to subglobose, hollow, reaching a length of 8 cm. and a diameter of 3-5 cm. ; pits deep, short, longitudinally elongated; yellowish-brown; ribs anastomosing, thick, up to 2-3 mm. wide, dark smoky brown, velvety, covered by the brown, projecting ends of the hyphae. Stalk hollow, slender, whitish, furfuraceous, irregularly lacunose below, reaching a length of 3-5 cm. and a diameter of 1-1.5 cm. Hymenium lining the inside of the pits, yellowish-brown; asci 8-spored, subcylindrical, somewhat contorted, 325-375 x 20-24 µ. Spores ellipsoid, 22-26 x 13-15 µ, smooth, usually with two small, indistinct oil-drops. Paraphyses few, stout, swollen above to 20 µ. On the ground under Douglas fir trees, Redmond, Washington (Snyder), April 27, 1935." 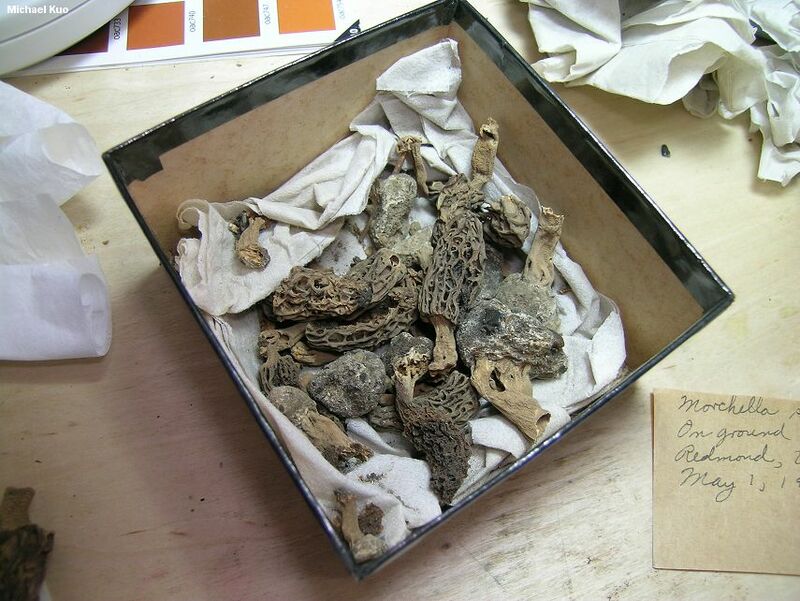 The holotype of Morchella hotsonii is held in the Herbarium of the Burke Museum of Natural History and Culture at the University of Washington (WTU). 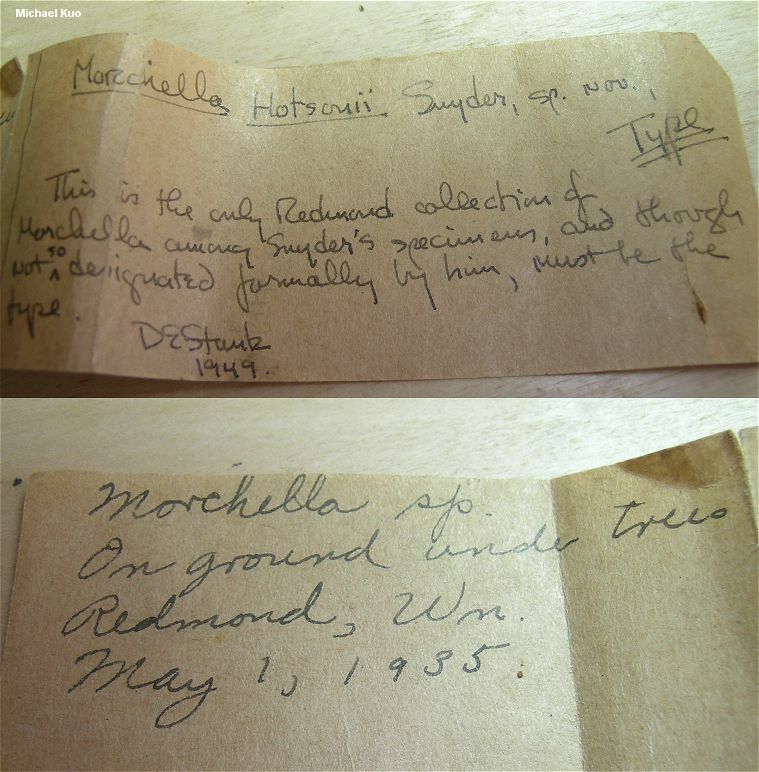 A note from D. E. Stuntz, dated 1949, accompanies the collection: "This is the only Redmond collection of Morchella among Snyder's specimens, and though not so designated formally by him, must be the type." The collection consists of: two fairly complete ascomata labeled #1 and #2; one hymenophore labeled #3; (no labels for #4 or #5); a label for #6, unattached to anything; five additional ascomata containing both hymenophore and stipe; eight additional complete or partial hymenophores; 12 additional stipe fragments; one hardened, unattached mass of substrate; and many additional fragments of ascomata and substrate. The partial and complete ascomata are fairly well preserved. The three specimens illustrated in Snyder's 1938 publication cannot be aligned with confidence to any of the specimens in the holotype collection. Data from study of the holotype. Dried ascomata 30-60 mm high. Hymenophore 22-46 mm high x 11-31 mm wide, with 12-18 primary vertical ridges and occasional shorter, secondary vertical ridges, with frequent sunken, transecting horizontal ridges creating a "laddered" effect. Ridges finely tomentose; flattened, or in more mature specimens becoming sharpened or eroded. Pits very finely tomentose. Stipe 12-19 x 4-20 mm; punctate to densely punctate with granules; ridged in places. Ascospores elliptical; smooth; contents homogeneous; 20-25 x 11-16 µ. Asci 175-275 x 15-25 µ; 8-spored; cylindric; hyaline in KOH (2%). Paraphyses 100-175 x 5-12.5 µ; cylindric; septate; apices rounded or subclavate; hyaline in KOH (2%). Elements on sterile ridges 90-175 x 7.5-27.5 µ; septate; terminal cell widely cylindric with a rounded apex, subclavate, clavate, or occasionally widely subfusiform; with hyaline to brownish or brown contents in KOH (2%). DNA was successfully extracted from one ascoma in the holotype collection following the methods of O'Donnell and collaborators (2011); ITS and nLSU sequences placed the specimen in the elata Clade, near species Mel-19 and species Mel-20 as defined by O'Donnell and collaborators (2011). Multilocus DNA sequence data from more informative loci is needed to critically assess whether this collection represents a phylogenetically distinct species; we were unable to extract informative DNA from a second specimen. Discussion. Although we did not attempt to sequence all of the complete and partial ascomata in the type collection, ITS and nLSU sequences of one specimen indicated it may not be not conspecific with any of the species reported for North America in O'Donnell and collaborators (2011)--nor was it conspecific with any of the specimens examined in Kuo and collaborators (2012). Because our sample size for North America is robust, we can state with a fair degree of confidence that Morchella hotsonii is extremely rare, and may not have been documented since Snyder's type collection. Woody substrate, apparently from woodchips, was attached to most of the stipe bases in the type collection, and several unattached chunks of wood were also present. 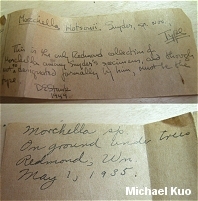 Since the type locality (Redmond, Washington, now a Seattle suburb) was a well established logging and agricultural community in the 1930s, with healthy railroad and shipping connections, we consider it probable that Snyder's collection was made in an urban area, perhaps in a landscaped area or among the detritus associated with logging operations; Morchella hotsonii may have been introduced. 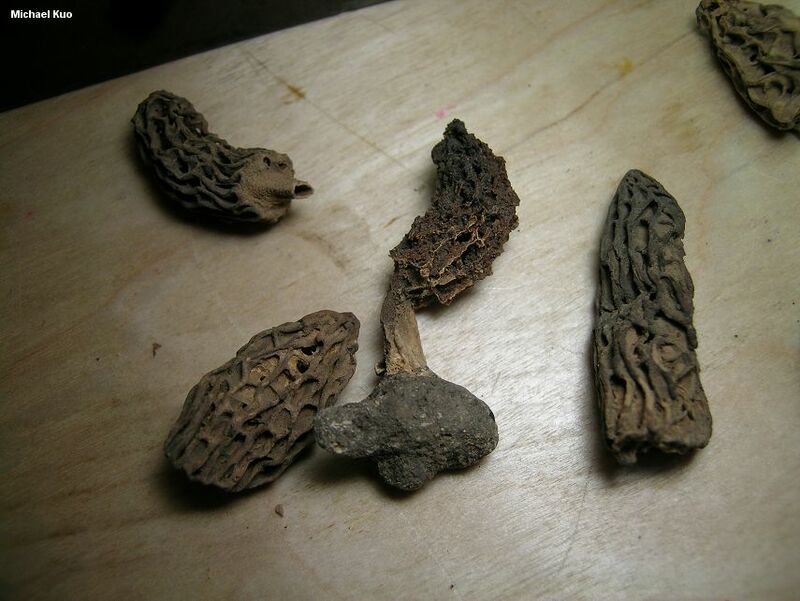 Morphologically the dried specimens in the type collection, as well as the ascomata illustrated in Snyder's publication, are quite similar to Morchella importuna, a woodchip species well documented by contemporary collections, distributed primarily in the northwest. However, the ridges and stipe surface of Morchella hotsonii are notably tomentose ("velvety" in Snyder's description) while the ridges and stipe surface of Morchella importuna are glabrous or very finely tomentose. Kuo, M. (2012, November). Morchella hotsonii. 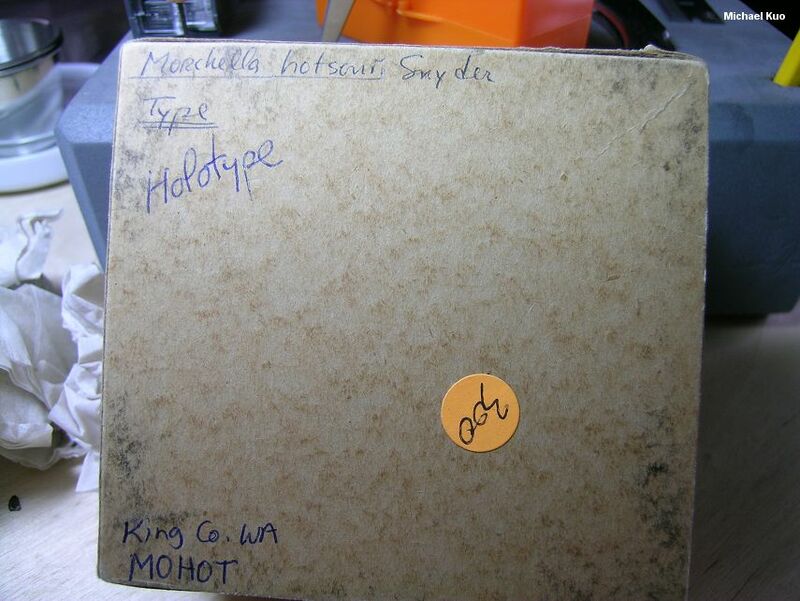 Retrieved from the MushroomExpert.Com Web site: http://www.mushroomexpert.com/morchella_hotsonii.html.